This information and its processing gives life its emergent complexity, which is why, Davies suggests, Dawkins-style reductionism to the gene level entirely misses the point. What's more, the biological setup provides a particularly sophisticated relationship between information and the physical aspects of the organism because the information can modify itself - it's as if a computer program could redesign itself as it went along. The subtitle 'how hidden webs of information are solving the mystery of life' probably over-promises. As Davies makes clear, we still have no idea how life came into being in the first place. However, by bringing in this physical/information aspect we at least can get a better grip on the workings of the molecular machines inside organisms and how biology can do so much with so little. Here's where the demon in the title comes in. This is Maxwell's demon, the hypothetical miniature being dreamed up by the great nineteenth century Scottish physicist. Maxwell's demon has the remarkable ability to tweak the second law of thermodynamics allowing, for example, heat to flow from a colder to a hotter body or, to put it another way, providing a mechanism for entropy (the measure of disorder in a system) to spontaneously decrease. 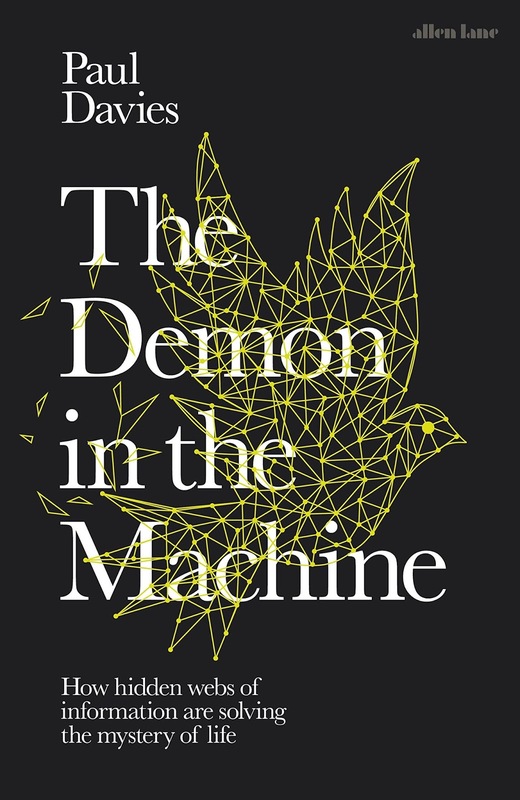 Entropy has a strong (negative) relationship with information and Davies shows how miniature biological systems act in a demon-like fashion to effectively manage information. There's lots to like here, from the best explanation I've seen of the relationship of information and entropy to fascinating coverage of how far we’ve gone beyond the selfish gene. This is not just about basic epigenetic processes (operating outside of genes, switching them on and off and so on) but how, for example, the electric field of a (biological) cell apparently has a role to play in ‘sculpting‘ the physical structure of an organism. 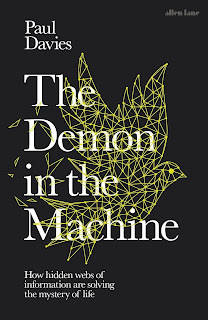 My only real complaint is that in part of the chapter Enter the Demon dealing with information engines and most of the chapter The Logic of Life, describing the relationship between living organisms and computation, Davies fails to put across clearly just what is going on. I read it, but didn't feel I gained as much information (ironically) as I needed from it. There was also one very odd statistic. We're told the information in a strand of DNA contains 'about 2 billion bits - more than the information contained in all the books in the Library of Congress.' There are about 32 million books in the Library of Congress, so that gives us on average 62.5 bits per book. Unless those are very short books, some information has gone astray. Really interesting, then, from a transformed understanding of the importance of information in living organisms through to Davies' speculation on whether biological systems need new physical laws to describe them. But expect to come away feeling you need to read it again to be sure what it said.